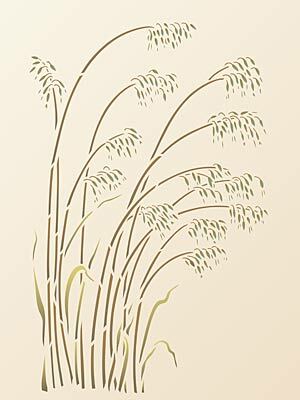 The Small Wild Oats Stencil – a single sheet one layer stencil of a clustered grouping of swaying oat grasses. 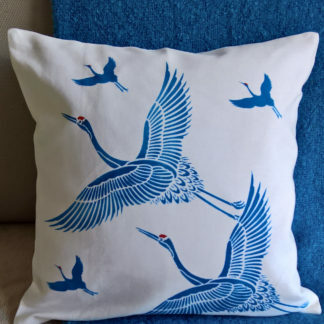 This delicate and elegant design is great on home accessories such as cushion covers, boxes, trays or mirror frames and is simple and easy to use. See size and layout specifications below. Above and top – the Small Wild Oats Stencil stencilled in Pure White Fabric Paint on a natural coloured linen cushion cover. 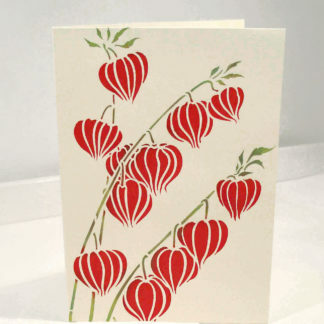 A simple and very pleasing contemporary effect. 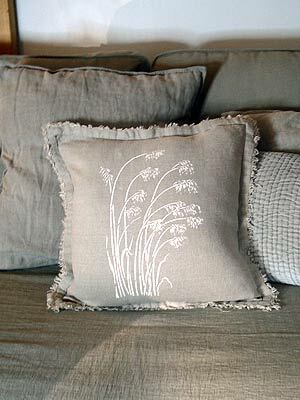 Above – the Small Wild Oats Stencil shown in Mocha and Spring Vine Stencil Paint on a warm apricot background. 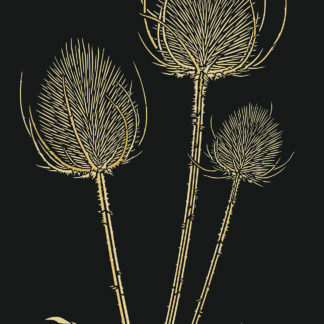 Above – the Small Wild Oats Stencil repeated at alternating heights. 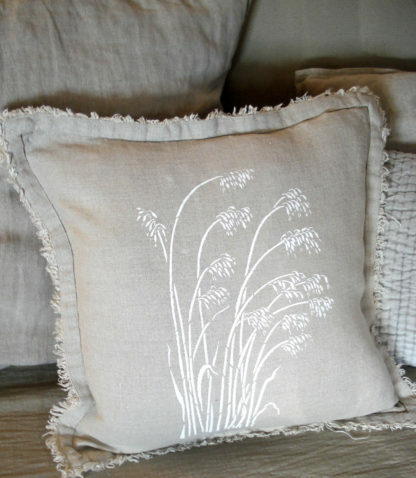 The Wild Grasses Stencil Range from Henny Donovan comprises a set of graceful designs chosen for their elegance and delicacy and instant appeal for contemporary decorating. 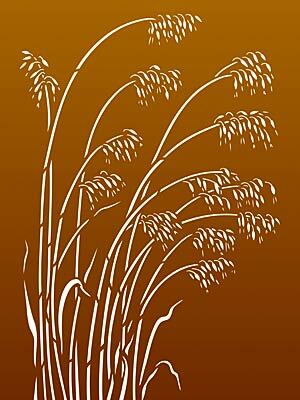 Use the different designs in combination or on their own to create beautiful wild grass murals and effects. 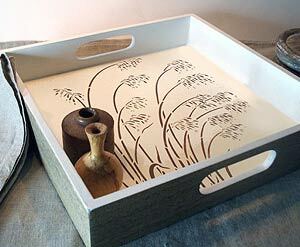 Above and below – the Small Wild Oats Stencil used here to decorate a wooden tray. Stencilled in Chocolat Stencil Paint. Varnish the tray to protect it with Acrylic Matt or Eggshell Varnish. Don’t want to commit a tray permanently to this finish or have difficulty stencilling inside shapes? 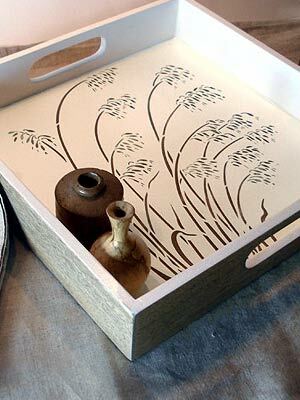 Stencil on thick card and cut to the inner dimensions of your tray to create a more temporary but beautiful tray liner! 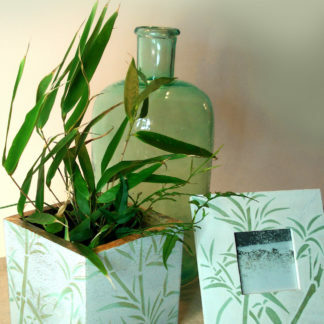 Above – the Small Wild Oats Stencil in Vanilla Stencil Paints on a spicy ginger background. 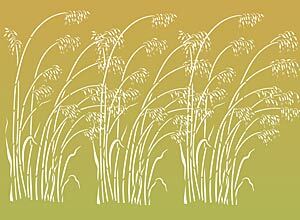 Above – the Small Wild Oats Stencil in Nougat on a rich ochre background. 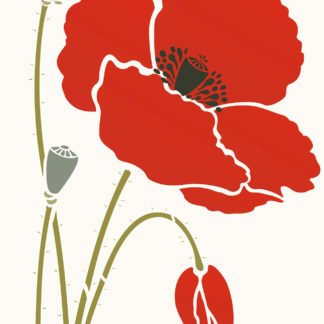 Above – the Small Wild Oats Stencil repeated in a horizontal row. 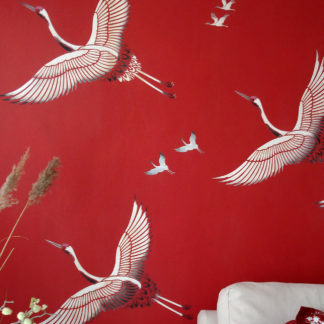 Above – the Small Wild Oats Stencil in the graduating colour tones of Coffee Bean, Latte and Vanilla Stencil Paints. 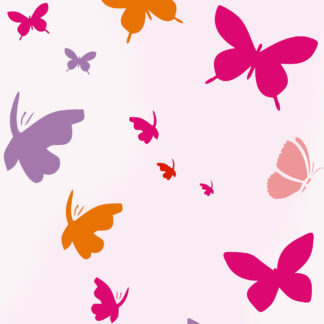 This single sheet one layer motif stencil is made of 125 micron mylar. 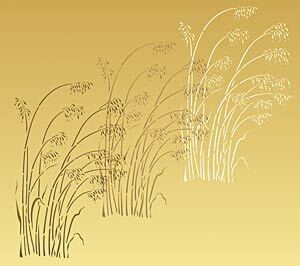 Overall grass motif measures 30cm/11.75″ tall x 19cm/7.5″ across at widest points. 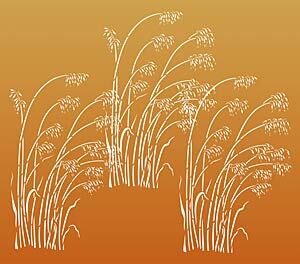 The seed head groups are on average approximately 4cm/1.5″ wide. 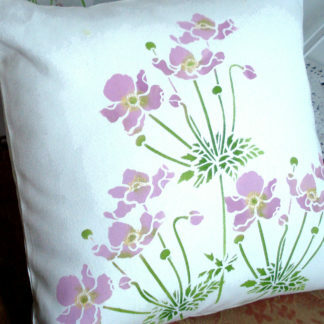 Sheet size 35cm/13.5″ Tall x 28cm/11″ wide. 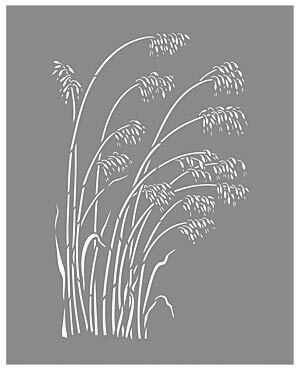 Left – layout of the Small Wild Oats Stencil sheet.